Soluto is presented as "anti-frustration software", and it really helps getting rid of frustration, at least the frustration of having to wait while rebooting your PC. 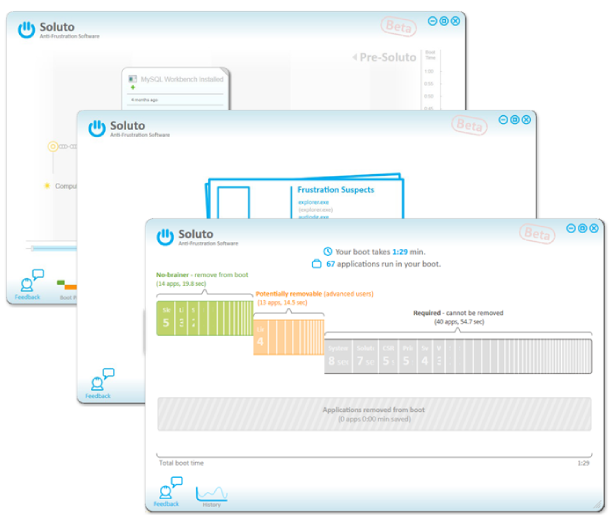 With Soluto you can improve the computer's start-up time. Soluto's software combines low-level driver technology with collective wisdom, to detect PC users' frustrations, reveal their cause, learn which actions really eliminate them and improve user experience. Bring an end to PC user frustration with transparency, killer technology, etc. Soluto employs innovative low-level Windows kernel technologies to identify what users are asking their PC to do, and what their PC does in return. Soluto is able to pinpoint and analyze what resource obstacles stood in the way of the user's desired actions. These can be I/O issues, network issues, resource locking, and so on. Soluto uses the same technologies to determine what actions users took that had a positive effect on their computing experience. For example, pausing certain processes and reconfiguring certain applications can dramatically improve the behavior of a particular piece of software. Qweas is providing links to Soluto Beta 1.2.231.0 as a courtesy, and makes no representations regarding Soluto or any other applications or any information related thereto. Any questions, complaints or claims regarding this application Soluto Beta 1.2.231.0 must be directed to the appropriate software vendor. You may click the publisher link of Soluto on the top of this page to get more details about the vendor.